Beat The Burglar This Christmas! Crime has increased this year, with approximately 850 more crimes reported per day than this time last year, the majority of which are muggings and burglaries as reported by 'The Mail Online'. 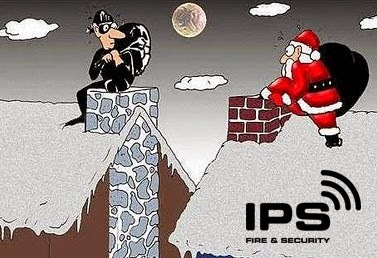 Here is how IPS Fire & Security suggests you beat the burglar! Festive Lighting - Be aware of how you connect up any external lighting, burglars know many people don't have outside sockets and this likely means you've connected them inside by leaving a window open. Social Media - As with our previous blog post this still remains relevant! Don't let the burglars know your whereabouts, it makes their burglaries a whole lot easier. Hidden Keys - Don't leave keys under mats and plant pots, this is one of the most basic security tips and one criminals have been taking advantage of for years! Holidays - If you're going away over Christmas don't make it obvious, stay off the social media, ensure plants are watered, lights are on timers and post isn't piling up by the door. Garages & Sheds - Ensure you lock your Garage/Shed and keep all valuables out of sight. Intruder Alarms - Make sure your alarm has been serviced to ensure functionality and ensure you arm it when you leave the premises. We hope everyone enjoys the Christmas holidays and remember to stay safe and secured. Why Social Media Is The Unsuspecting Security Risk! Whilst security systems are always evolving, so are burglars tactics. Social media has seen tremendous growth throughout the past 5 years and like many things people find a way to exploit this, in our case - burglars. Sharing too much online puts you at risk. We recommend making your profiles private and ensuring that you only accept people you know and trust. Holiday Countdowns - "3 Weeks until Ibiza!" may be something you're looking forward to, but it may also be something a burglar is looking forward to. Knowing if a premises is occupied or not makes a burglars job a whole lot easier. Burglars are not the only threat however, squatters could also use this information meaning you could return home from a relaxing break to find your property occupied! Checking In - Checking in at businesses is often encouraged and some places even offer rewards or discounts for promoting their social media accounts on your profile. As with the above scenario it to can notify a potential burglar that you are not in the premises and also put anyone you check in with at risk too. Property Damage / Building Works - Whilst you may want to show off your new extension or talk about storm damage to your property, it may be an indication you could be living elsewhere whilst work is undertaken. It may also suggest that your security systems are not armed if serious damage that leaves the property and vulnerable is shown. Room Layouts - Be wary of any internal photos of your property that you upload and share, burglars can piece together many different photos to try and map out your property before-hand to ensure the quickest entry / exit route. You may also inadvertently display valuables that they may want to specifically target. Events - When responding to event invites on Facebook it is often hard not to publicise your attendance, so it may be worth notifying the host via other methods. It can help a burglar plan his break-in and also give them ideas of the timescale you will be gone for. All of these combined can make a burglary a whole lot easier for the potential criminal, by making your social media accounts private you can help prevent you and your friends / family from being targeted by the modern criminal. If you are using social media you can follow IPS on Facebook, Twitter, Google Plus & LinkedIn. Welcome to IPS Fire & Security's new website, it now features a much clearer layout, more information, and all of our updated services, helping you find out what we can do for you and what systems we can save you money on. If we can help you with anything please e-mail us at admin@ips-security.co.uk or call us on 0845 555 6 999 or visit the Contact page for your local numbers.